It’s sci-fi! It’s horror! It’s a camp classic with foam rubber monsters! It’s Metalunan madness! Ah, This Island Earth. Perhaps no movie more adequately typifies the strengths and weaknesses of the 1950s genre film than this wonderful little gem from 1955, making it a perfect destination for our time traveling experiment. For a long time now, this has also been the movie that has been most closely linked to Mystery Science Theater 3000 because it was this movie that MST3K chose to lampoon for their own 1996 feature film debut. In fact, I bet most of my entire generation knows about this movie thanks to MST3K, which was a juggernaut during the mid-nineties. 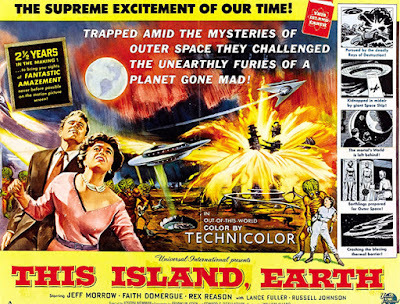 I know it was my first exposure to This Island Earth, and I know it was for my wife and several of my friends, as well. However, as with every movie that MST3K set in their sights, I recommend that you also watch the movie as intended, without people talking at the screen for 90 minutes. Furthermore, if you’ve only seen the MST3K version, you’ve missed 20 minutes of story, because the film was edited down for length. Don’t settle for less than the 86-minute theatrical cut of this movie because the extra minutes matter. I laughed until I hurt when I first saw Mystery Science Theater 3000: The Movie as a teenager. Now as a cinephile, when I watch MST3K and how they treat movies, I just hurt. 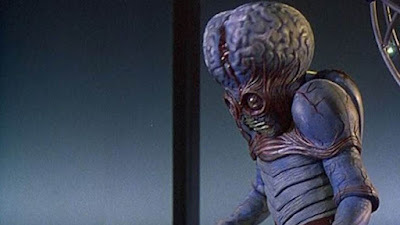 In case you haven’t guessed, I think This Island Earth is a fantastic film and a wellspring of the kind of culture that makes me cuckoo for Cocoa Puffs. It’s a Universal film, and I think that it--and other mid-fifties flicks like The Creature from the Black Lagoon--represents Universal keeping their fingers on the pulse of what truly scared audiences. On the surface, it’s easy to make fun of the movie; it seems to lend itself to satire. However, when you look past the goofy aesthetic, there’s a ton of stuff going on in the movie that can be unpacked and examined. It was made at a time when I personally believe science fiction was at its peak powers. After World War II, science and technology experienced an unprecedented boom that ultimately led humanity to the moon. It was also a dangerous age when suspicion was everywhere. Millions of Americans had everything they had ever wanted: technology, industry, personal property, independence, automobiles, houses in the suburbs, and jobs in the city. The fear of losing all this so-called progress to another war or to the enemies of freedom made everyone a little bit paranoid. Enter This Island Earth. As a lifelong comic book fan, I’m struck by the similarities in this story to the comic book title Green Lantern, which follows the adventures of test pilot Hal (versus this movie’s pilot Cal) who commands enormous power with his Green Lantern ring (this movie features a powerful green energy beam) for an alien race (Cal’s adventure leads him beyond Earth’s boundaries). I don’t think that This Island Earth necessarily borrowed elements from the long-running comic, but I think there are definite similarities that I appreciate. I also appreciate that this movie doesn’t dumb things down for its audience. These characters aren’t stupid: Cal decides to accept Exeter’s invitation not out of some blind sense of adventure, but because he realizes that Exeter has knowledge that belongs in a textbook that would benefit everyone. What’s more, when he meets up with Dr. Ruth Adams, she’s no dummy either. This is a highly-successful career scientist with a PhD who also just happens to be a woman. Progressive stuff for 1955. While she’s also here to be chased and scream in terror, she’s not written as an airhead foil for the man’s affections. There are no smooches. The acting is full of fifties bravado, but it’s fun. Rex Reason (we need more movie stars named Rex) is your typical fifties action hero, brave and quick to action, but also intelligent and not without reason or humanity. 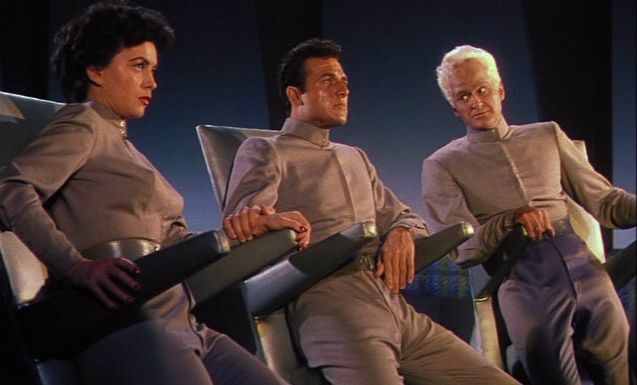 Faith Domergue gets to display an intelligence and confidence that was slowly becoming a feature of many fifties films, and she gets to do a lot besides run and scream, though things do ultimately end in a lot of running…and screaming. Jeff Morrow might be the real stand-out as the mysterious Exeter. He gets to play a character that is commanding yet kind, mysterious and potentially dangerous. All this is directed by Joseph M. Newman, a filmmaker with a workmanlike style who nevertheless brought some really good movies to the screen. He was behind a string of really good fifties westerns that starred guys like Tyrone Power and Joel McCrea. You can’t go wrong. The special effects of This Island Earth get better and more frequent as the film unfolds. Sure, they don’t hold up by modern standards, but they were absolutely cutting-edge in 1955, and many of them still work incredibly well today. The script called for some pretty ambitious effects shots, and the movie mostly pulls them off. The flying saucer ship looks great (no wires!) and the optical effects actually look better than similar stuff from ten years later on shows like Star Trek. There’s also a fantastic score for the film which is completely uncredited. According to the internet, Henry Mancini, the man who wrote the legendary themes for Peter Gunn and The Pink Panther was one of three composers who contributed. Where This Island Earth really wins me over is through its themes. We have a race of beings from the planet Metaluna who are being driven away from their home planet because of war. And not civil war, either, but hostile war from outsiders attempting to annihilate them. The Metalunans want to come to Earth so that they can survive and live peacefully among its citizens. In return, they have technology and culture and scientific knowledge that they’re willing to share. Whether they will succeed is actually what this movie is about, and why it needs to be seen free from satirical commentary. When you replace the word “Metalunans” with the word “refugees,” you begin to see that the story is as relevant today as it was in 1955. Strip away the fun stuff like rubber monsters, flying saucers, and intergalactic space shenanigans, and you’re left with a story about a group of people seeking survival in a hostile environment. The Metalunans are, in their own way, the last of the Mohicans. Like good science fiction is supposed to do, This Island Earth is really about us and how we treat the unknown, and maybe the unwanted. It manages to do all this without being preachy because the movie doesn’t choose a side. Anyway, I don’t think it’s as interested in presenting sides as it is showing us the situation and letting us relate to it in our own way. It challenges us to think about some heavier, real-world issues, and it throws in some monsters and spaceships just for fun. I worry sometimes that This Island Earth has become more of a punchline than a serious part of film history, and that really bums me out. We live in a time where things that look cheaper or different than our current blockbusters are easily dismissed as being worthless, when they’re usually filled to the brim with snappy dialogue, human emotion, and reflections of who we were and still are. It’s so interesting to me that a movie like this was made over sixty years ago, yet has lost none of its message. Like a lot of the science fiction, horror, and western films from this era of filmmaking, it’s up to you as to how deep you want to analyze the story. It can be a fun midnight movie about white-haired aliens and insect monsters that’s fun to laugh at. If you dig a little deeper, maybe you’ll be rewarded with a meditation on how we deal with outsiders, but you don’t have to take that away from it. The beauty of the film is that it doesn’t necessarily take any hard stances on complicated issues or pontificate morality. Just like in life, the movie leaves it up to you. Holy flurking schnit, this film is fun. I saw it when I was a youngling but never grokked how awesome it was until now. Has anyone ever had a voice as manly as Rex Reason's? That guy makes Darth Vader sound like Richard Simmons. I don't know where his testicles were but I don't think they were where they were supposed to be. Thanks for the blast from the past, H2 Whoa. Favourite line: "Ruth, don't tell me that as a woman you're not curious about our destination." Ruth must have been forewarned that Metalunian interstellar craft had scant lavatorial facilities for women. Typical 1950s space-alien spaceship engineers. I've never seen that Mystery Science 3000 thing, but it sounds kind of lame and hipster douchebaggy. There was a BBC radio programme called Atomic Tales which spoofed the sort of square-jawed-hero, America-knows-best science fiction stories of the 1950s onward. It ran for only one series, I think, but it's worth a listen if you can find it. That isn't how you build an interocitor, by the way; Meacham didn't have a clue what he was doing. The Metalunians must have been impressed by his sonorous voice and supreme manness. Better watch and keep watching the skies, Heath. Dammit, I'm being a douche myself, and I didn't mean to be. This Island Earth is a really nice film. It can hold its own against Forbidden Planet, the original The Day the Earth Stood Still, or any classic science fiction movie from that era. Thanks, Heath. The sentiment about refugees was really thoughtful, too.